Guest blogger, Loren Shlaes is a registered pediatric occupational therapist and a regular contributor to the special needs blog at PediaStaff (where this post is also being published). This is the fourth in a series of posts from Loren about how to help students who may be challenged with attention, sensory, or other issues be successful in the classroom. Most likely, you have at least a few students with these challenges every year, but even if you don’t, the information in these posts are relevant to all teachers. Did you know that those fat pencils and crayons actually don’t help your students to learn to write? I didn’t! I learned so much from reading this post, and I know you will, too! The ability to write is one of the very highest levels of human achievement. Learning to write requires a great degree of fine motor control and visual motor coordination, along with sufficient attention span and frustration tolerance. Forcing a child to learn to write before these underlying skills are solidly in place is counterproductive. In New York City, where I practice, children are expected to be able to write at the age of four. In my clinical opinion, this is two full years before they are developmentally ready and does more harm than good. If a child does not yet have the internal strength and stability to perform such a high level task, in order to comply with the grownups’ demands, he is going to have to manufacture it by straining and contorting his body in a very unnatural way. This sets him up for a lifetime of poor posture and bad habits. Handwriting, across the lifespan, is a necessary daily skill and a direct reflection of who we are, and don’t let anyone tell you anything different. Children who cannot write easily and legibly struggle in school. Do you want to give your pupils the very best start to their academic lives, give them confidence in themselves as scholars, and provide them the tools they need to succeed? 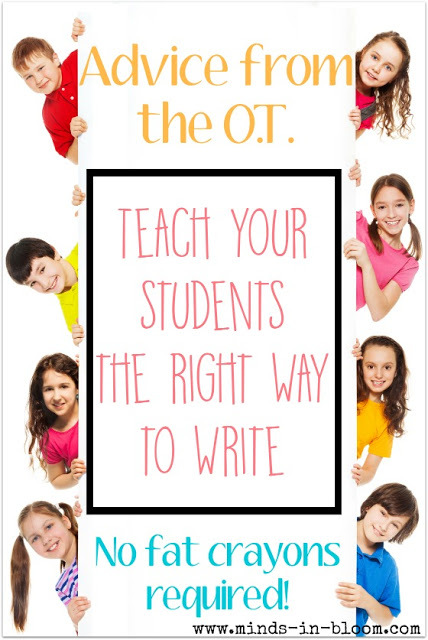 Teach them legible, rapid penmanship so that they can write down their thoughts and do their schoolwork quickly and easily and enable them to represent themselves and their abilities to their best advantage. In order for a child to be able to write well, he must be formally taught how to do it. If the child is left to guess for himself how to write letters, the chances of him being able to write fast enough to keep up with his thoughts and to stay legible are poor. The only way to write both neatly and quickly are to start all of the letters from the top and to have the hand traveling in the same direction. If the child starts his letters from the bottom, or if his hand is moving from right to left, or if he is taking many extra strokes, then he can only write neatly if he writes very slowly. When he speeds up, his writing falls apart. So, he can either write neatly or legibly, but not both at the same time. Teach him the correct habits of letter formation, and you’ve gone a long way to make sure that no one will ever have to force him to redo his homework because no one can read it. If a child is required to produce written work while he is still struggling to remember how the individual letters are supposed to look or which way to turn the tail on the J, his mind will be so taken up with the mechanics of getting the letters down that he won’t have much mental energy left to formulate or express his ideas. Wait until all the letters are formally taught and the children’s writing is automatic in nature before requiring them to write compositions or keep a journal. If you don’t know how to teach handwriting, I highly recommend that you attend the one-day “Handwriting without Tears” class. If you go to their website, you can either find a class coming to your area or, better yet, hire one of their instructors to come to your school or district and teach all of you. You will have all the tools you need to become a first rate handwriting instructor. The teaching materials were developed by an occupational therapist who had a special needs son of her own. Her methods are superb and get great results. How a child holds his pencil is critical to his comfort while writing for long periods and to his ability to control the strokes. The most comfortable, efficient grasp is called a dynamic tripod. The thumb is bent, the forefinger and middle finger form an open ring, the arm and wrist stay still, and the fingers move in and out of the palm. Being able to hold and use the pencil this way depends on the strength and stability of the trunk. A strong, sturdy body provides the necessary foundation of support for the refined, controlled movements of the hands and fingers (this is one of the reasons it is so critical for children to exercise and to move their bodies when they are young; it develops the necessary internal balance and stability required for the fine motor coordination in the hands and eyes). Preschool and kindergarten teachers can assist with acquiring good pencil grasp patterns by getting rid of all of the markers, fat crayons, giant paintbrushes, and sidewalk chalk, substituting them with one-inch nubs of chalk and crayons, and cracking off the handles of the paintbrushes. This way the children are forced to hold all of the drawing, painting, and writing materials in a strong, open pinch. Don’t worry if they can’t manage them very well at first. Developing that strong pinch is far preferable in the long term than the child being able to draw you a nice picture with a fist around a fat crayon in the short term. Standing at easels to paint and draw strengthens and stabilizes the shoulders, elbows, and wrists. Old-fashioned chalk boards are an excellent way to practice letters and draw pictures. The chalk provides plenty of traction, nobody minds broken chalk, and erasing the board in big sweeps is a great activity for little bodies. Playing with Play-Doh and modeling clay is a wonderful way to strengthen little hands and fingers. I also recommend that the children do lacing, beading, and crafting projects to train their hands and eyes to work together. Small children have not yet developed the internal structure that allows them to organize their handwriting without lines to guide them, so providing them with lined paper is best. One problem with conventional dotted paper is that it’s too busy. There are so many lines that the child doesn’t know which ones to follow, so he ignores all of them. The other problem is that the lines are often larger than the child’s finger excursion, so he is having to strain to make his letters as big as the paper is requiring. Blank paper doesn’t help the child organize his work. I like the plain double lined paper utilized in the Handwriting without Tears program. The child writes his letters within the double lines, which teaches correct sizing and keeps his work very neat and organized. I am LOVING this series! Please, keep these posts coming. This is a great post with excellent information! Every teacher should read this! Thanks so much to both of you for commenting. I know Loren will be glad to know that you are finding valuable information in her posts! I've been working on teaching my soon-to-be kindergartener how to correctly hold his pencil, and it is a challenge! I love the idea of using the small pieces of chalk, etc. to strenthen the "pinch". I never would have thought of that! He is left-handed; any suggestions specific to that? One of the problems lefties face when being given words to copy is that the models are normally presented on the left, so their hands are covering up the model. Make sure that there is a model for him to copy presented on the right. His paper should slant in the opposite direction which means that the upper left corner of the paper should be in line with his left shoulder. Slanted cursive is extra difficult for lefties. Cursive should be taught in vertical. Handwriting Without Tears uses vertical cursive which is far easier to both read and write. Pens with liquid ink tend to smear as the left hand travels over what is written, so he should write with pencil or use a ball point. I know this post is old, but I'm hoping you can answer my question! I am a fourth grade teacher and one of my students is dyslexic and dysgraphic. This diagnosis had not been recognized prior to this year. He really needs some help with his handwriting. It really impairs his ability to show what he knows. Could he benefit from seeing an pediatric occupational therapist at this point? We are a private school and don't have any resources. I am struggling to help the parents find a way for him to improve. Thanks for your help. Fourth grade is not at all too old to be helped by sensory integration therapy. In terms of the handwriting, what the OT can help clear up is the poor habits of letter formation, which will make the mechanics easier. Someone who is familiar with the Handwriting Without Tears program would be their best bet. The parents would have to commit to daily practice in order to make changes in longstanding poor habits. In addition to the occupational therapy, a consultation with a neurobehavioral optometrist to assess the need for vision therapy, and a consultation with a learning specialist who works with executive functioning issues, would give them some strategies for organizing homework. Excellent! As a teacher and mom, I agree wholeheartedly that we do children a disservice by not teaching correct, neat, fluid handwriting. Thanks for the suggestions; I need to incorporate a number of them with my preschoolers. Very informative post. Thank you; I learnt a lot! 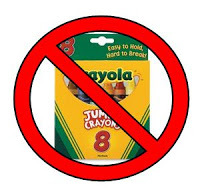 Very interesting to learn that crayons and markers can be counterproductive. The Handwriting without Tears paper looks like a big improvement too.